We have recognized so many deserving people, but have not yet recognized a group who is perhaps most deserving. Graduates, you would not be here if it were not for the support, care and love of your parents, guardians and families. They have many, many times cheered for you. We need to recognize them. So graduates, I ask you to turn and applaud those without whom you would not be here: your parents and families. After much ceremony and many speeches, I have little more to add by way of a charge, except this. 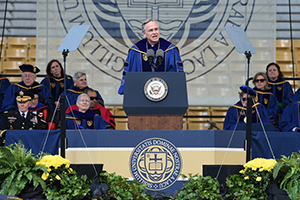 Take what you have learned here at Notre Dame and let it enable you to go forth and do good. Always be generous as you can with your time, talent and all you have. In your family life, your professional life and your spiritual life, every day of your life, make it matter — as General Dempsey instructed you. One of my true joys as President is to meet alumni of Notre Dame all around the world and hear of their remarkable accomplishments and of their dedicated service. There will, I am sure, be successes and accomplishments for each of you in your future. I look forward to the time, years hence, when I will meet you and feel proud that you are a graduate of this institution. I am also sure that there will also be challenges, frustrations, disappointments and detours in your lives. Know that you are in our prayers here, and where ever you go, and whatever happens in your life, you will always have a home at Notre Dame to renew your heart and refresh your spirit. May he shed his light upon you. Guard, guide and protect you always. We are extremely fortunate that we have as one of our honorees a world-renowned musician, Arturo Sandoval, who has agreed to play Ave Maria for us. I would like to ask Mr. Sandoval to play this beautiful hymn to Our Lady.